Perry Link, professor at UC Riverside and professor emeritus at Princeton University and John Kamm, director of the Duihua Foundation, weigh in on Chen Min's commentary Why China Won't Listen with letters to the editor of the New York Times. Mr. Chen advocated taking a quiet approach to human rights in China, arguing that foreign pressure was counter-productive. Perry Link quotes Mr. Liu Xiaobo, now serving an 11-year prison sentence, who wrote that “I should emphasize that for people like me ... every little bit of good-hearted encouragement that springs from the human nature of people who live in other places ... causes us to feel gratitude and awe.” This mirrors what rights lawyer Gao Zhisheng told me last year when he was briefly freed from police detention. Mr. Gao said that when he and other dissidents were in prison, it was the knowledge that people outside were fighting for them that kept them going during their worst moments. I'm also thankful for John Kamm for pointing out that China does indeed bow to firm outside pressure on behalf of human rights victims. He writes: "Public pressure has complemented private diplomacy. If China’s leaders decide that it is in their interest to stop the abuse of Chen Guangcheng, the abuse will stop. In China, interest trumps face." 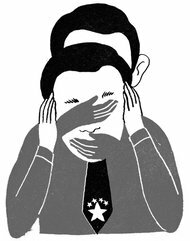 Who Should Speak for Activists in China? His advice contrasts sharply with what China’s dissidents themselves have been saying for years. Here Mr. Liu echoes Wei Jingsheng, Xu Wenli, Liu Qing, Wang Dan, Jiang Qisheng, Ai Weiwei and many other veterans of China’s political prisons. Are we to believe that Chen Guangcheng is different? Or can we wait for him to speak for himself on what should or should not be kept “behind closed doors”? The writer, professor emeritus of East Asian studies at Princeton University, is chancellorial chairman for teaching across disciplines at the University of California, Riverside. In May 1990, I intervened on behalf of a Chinese political prisoner at a banquet attended by Chinese officials. I was on my way to Washington to testify on China’s most favored nation status. I was told by experts on China that China’s leaders would never release a prisoner in response to foreign pressure, as doing so would be a loss of face. But the prisoner was released. China’s leaders were more concerned with losing most favored nation status than they were with losing face. Since then, Beijing has released hundreds of prisoners in response to calls from legislators and rights groups. It has done so to avoid sanctions, deflect criticism and smooth the way for state visits. Public pressure has complemented private diplomacy. If China’s leaders decide that it is in their interest to stop the abuse of Chen Guangcheng, the abuse will stop. In China, interest trumps face.